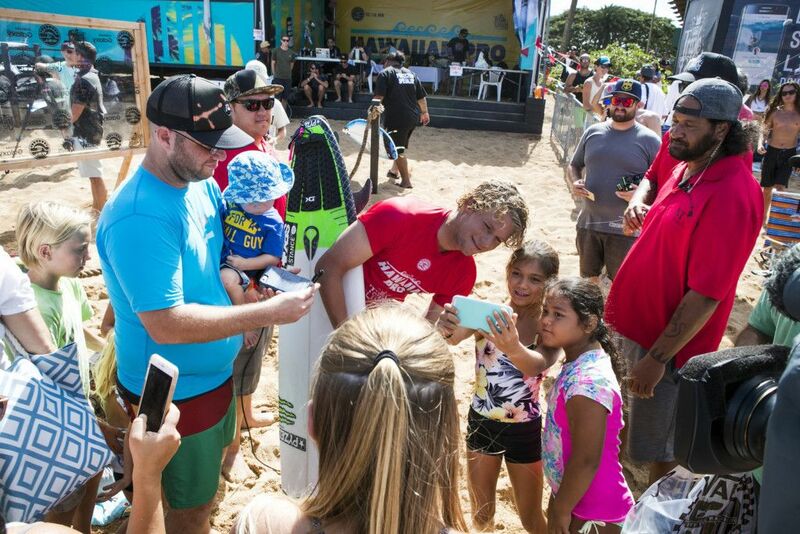 HALEIWA, Oahu/Hawaii – (Tuesday, November 15, 2016) — Current World champion John John Florence (HAW) drew an enthusiastic crowd to Haleiwa Ali‘i Beach for Day 3 of the Hawaiian Pro, a World Surf League (WSL) Qualifying Series (QS) 10,000 event and the first stop of the Vans Triple Crown of Surfing. After a heartwarming homecoming and the biggest victory of his career, Florence competes at Haleiwa with no pressure, which made for a highly entertaining performance featuring his signature free surfing style. Florence has yet to win the Billabong Pipe Masters, but has taken a Vans Triple Crown title in 2013 and 2011, and saw victory at Sunset during the 2011 Vans World Cup. With a strong appetite to win in his backyard, John John is off to a successful start after advancing in first from his Round Three heat. Florence went up against a fiery heat that included former Vans Triple Crown champion and Hawaiian Pro winner Sebastian Zietz (HAW), talented dark horse Torrey Meister (HAW) and Australia’s Dion Atkinson. While every surfer has their sights set on a win in Hawaii, nobody tops Kelly Slater (USA) when it comes to seeking a John John upset at Pipeline. Last year at the Billabong Pipe Masters, Florence lost to the 11x World Champion in Round 4. Slater competed at the Hawaiian Pro for the first time in four years and started his campaign off strong with a 9.00, the highest single wave score of the morning, and the heat win. He had victory earlier this year at the first Qualifying Series (QS) event of 2016, the Volcom Pipe Pro, and then again at the Billabong Pro Tahiti in August, and is hungry for another win. In the most jaw-dropping performance of the day, Griffin Colapinto (USA) scored a 9.93 in the last second of the heat for a hail mary air reverse on a closeout. Touted as one of the best heat finales ever at Haleiwa, Colapinto catapulted from third to first and knocked Tanner Gudauskas (USA) out of the competition. With above-the-lip progression, Colapinto, 18, surfed well beyond his years to advance into Round 4. 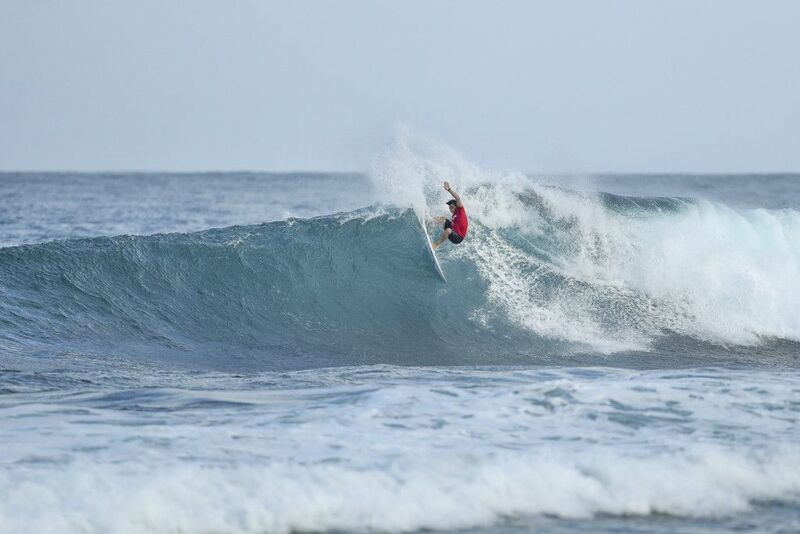 Another standout in today’s conditions was local boy Keanu Asing (HAW), who took the heat win ahead of Tahitian powerhouse Mihimana Braye (PYF), Yago Dora (BRA) and Alex Ribeiro (BRA). Asing had his first professional victory on the CT in France last month, which shot him up the rankings to No. 23 on the Jeep Leader Board. One step closer to a win on home turf, Asing is already celebrating the Hawaii wins thus far. 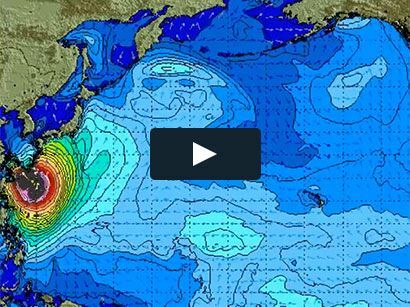 Finals day at the Hawaiian Pro looks likely for this Friday, November 18 as the waves are forecast to rev back up for a solid NNW swell in the 10-15ft. range.